More likely than not, you are reading this article on your pc, laptop, or tablet connected to your wireless network while you iPod/iPhone is playing music on the desk thru speakers. You’re in a very comfortable position on your bed and the tracks playing don’t suit your taste. Stand up no more! DokRemote is an iPhone/iPod music player remote control application built with your comfort in mind. As long as you’re on a device with a web browser that’s connected on the same wireless network as you iPod/iPhone is, you’re only a few clicks away from controlling the songs on your iPod/iPhone. DokRemote allows you to play or pause your music, skip backward or forward, control the volume and browse your entire music collection. DokRemote is snap to use. 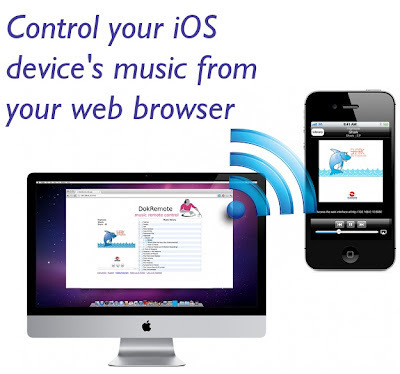 On the main view, the application displays a URL, which you’ll enter on your browser to control iPhone/iPod’s music player remotely via a web browser. Yes, it's that easy! Get DokRemote on iTunes now ($0.99).